access road to the Wayne Kirch Wildlife Management Area. There’s a good reason, actually several good reasons why I like traveling to fishing destinations on weekdays. 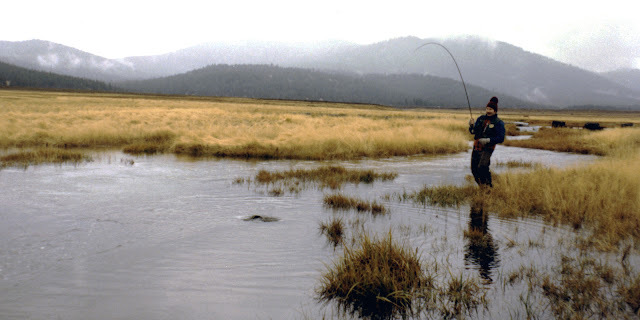 First, the fishing is always less crowded on a weekday, which enhances the feeling of solitude as well as the susceptibility of the fish to take the lure (trout don’t like boats constantly traveling overhead and the persistent “plunking” of lures into the water). But there’s another aesthetic benefit, at least if you consider wildlife viewing integral to the overall aesthetic experience. Traveling when there are few “other travelers” always increases the chance of seeing wildlife in their natural habitat. Then of course, there’s the guilty pleasure of either being retired or stealing a day off when traveling in the middle of a workweek. I noted three great herons lurking around Dacey. My first wildlife sighting was of three large pronghorn antelope bucks near Highway 318 at about the 38°02’ latitude, just north of the White River Narrows. I believe they were planning to traverse 318 from east to west, but when I pulled over and fumbled around to get my camera they had shot off towards the east. I attempted to get a picture, but at first the early morning sun shining into the lens destroyed whatever I shot. I then pulled the camera back deeper into the shade of the truck’s cabin, but by then those bucks we nothing but three little white butts bouncing way off in the high desert. However, I got another opportunity when I slid off 318 onto the southern Wayne Kirch access road. About 500 yards in a large heard of 30 +/- antelope crossed in front of the Trout Truck. This was unquestionably the largest pronghorn herd I’ve ever seen. And with this sighting at around the 38°20’ latitude, I can’t help but contrast their presence so far south when compared to Elko, NV (40°49’) or Casper, WY (42°50’). At this latitude each degree is about 69 miles, so from a north/south latitudinal basis Wayne Kirch sighting is about 280 miles south of Casper. Last of the antelope herd crossing in front of the Trout Truck. 20 miles off in the distance. My point is I don’t think I would have seen such a wondrous sighting on a weekend or holiday. The weather was sunny, but cool. The temperature upon arrival was about 40°, but it climbed to 60° by mid-afternoon. Winds were slight; I’d say 5 mph or less. The reservoir was about two feet low as they were dumping water into the Adams-McGill Reservoir, likely for the upcoming duck hunting season. Weeds were somewhat of a problem, but there was sufficient open water. As I was launching the Water Master Grizzly a couple guys appeared on the rip-rap dam bank to fish from shore an hour or so. One guy caught a 16-inch rainbow. They might have caught a few others, I didn’t notice. Nice male rainbow trout of about 18 inches in length. I caught all my trout in the morning, most in front of the two shore anglers. One of the trout I hooked was an acrobatic leaper, and based on experience I’d say it would have gone close to 20 inches. Although I was using a 4x tippet (about 7 lbs. test in fluorocarbon) because I knew the weeds would be problematic and the trout weren’t leader shy, I lost two really nice trout in the weeds when they either rubbed off or dislodged the hook. The lesson I learned was to muscle them harder to avoid their burrowing into the weeds, even if it risked a hook pull-out. After losing the high-jumping rainbow one of the shore angers hollered out, “you’re doing pretty good with that fly rod, what are you using as a lure?” At the time I was using the Whitlock damsel nymph. I was fishing my 9 foot, 5 weight fly rod with a full sink line with a 9 foot leader. I caught all the trout in the morning on the damsel nymph, but in the afternoon I switched to a black leech pattern. A plump hen trout of 17 to 18 inches based on the Fishpond landing net dimensions. Could the scarring on the back and sides be from herons and other predatory birds? in the Water Master Grizzly. Another fine fall specimen; note the missing right maxilla. All in all I landed 7 trout (one about 14 inches, four around 16 inches, and two that where close, if not actually at, 18 inches). I landed a plethora of young black bass, most in the range of 9 inches with one or two pushing 11 inches. As small as they were, they hit the fly with abandon and for a few seconds they really fought nobly. But alas, they were really a nuisance. Although I didn’t keep a precise count, I landed close to 30 fish in six hours of fishing plus 7 or so long distance releases. I could feel the weariness in my casting arm as I made the long drive south on Highway 318. It was a fulfilling type of weariness that comes from focusing so intently on something you enjoy immensely that you fail to recognize the physicality of the task until it is done. It was a very special day. One of the 20-plus young large mouth bass that were so often disappointing. this trout was a healthy 16 inches. mouth wounds, maybe as high as 30 to 40 percent. For those not aware, I am retiring from my chief financial officer position effective February 2, 2017. I intend to work part-time for a friend who's firm provides municipal securities advisory services to Nevada and its local governments, which will generate less stress, provide more time with the family, and just might produce an extra blog post or two… we’ll see. My wife and I have been looking forward to this milestone, and it is because of the blessings of the Lord that I can make this next transition in life at the young age of 60. Don’t get me wrong, I’m not saying belief in Christ results in wealth. I am saying that everything I have, every breath, every day of health, all my gifts and abilities, my wife and children, my job, absolutely everything I have comes from God. But of all his provisions, His gift of everlasting life with the Lord reigns supreme through the sacrifice of Jesus. I know I am a blessed man to be in a relationship with Christ Jesus, and everything else is gravy. For those interested to learn more of God’s provisions read Psalm 84:11, Matthew 7:11, Luke 12:24, Philippians 4:19, James 4:1-2, and 1 John 3:22. Hot Creek Butte in left foreground. A good view of the expanse of Dacey Reservoir looking over the tops of the tullies. The satiated FisherDad with trusty Trout Truck in the background.